Eleanor Cheney, a long-time major supporter of Visiting Nurse’s Alzheimer’s Respite Program, died Tuesday, October 14, 2014 at her home in Highlands, NC. A friend to many at Visiting Nurse, Eleanor and her husband Bill were honored at our 2013 fall benefit In the Moment—A Celebration of Life. The fall event featured a touching video of the Cheneys expressing what the Alzheimer’s program means to them and why they continue to support it. Fellow Alzheimer’s program supporter and Visiting Nurse Health System Board Member Emerita Lou Brown Jewell expressed her appreciation and introduced the video, and granddaughter Laura Cheatham Barnhart accepted the honor on behalf of her grandparents. 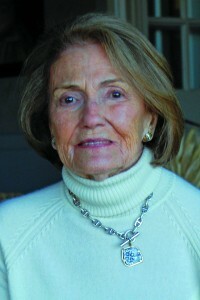 Twenty-four years ago, Eleanor’s father, John McCarty, established the program in honor of his wife, Margaret, who was suffering from Alzheimer’s. Recalling the physical and emotional stress that changed the course of her father’s life, Eleanor remarked, “My father took care of her for years, but it eventually got too much for him. He finally hired around-the-clock help. It was a very difficult time for them.” Eleanor discussed the turning point in her father’s life that made him take action and offer help to other families who were not as fortunate as they were to shoulder the burdens of such care, “One day, he saw a TV special about Alzheimer’s. It featured a man who was so overwhelmed by his wife’s illness, emotionally and financially, he felt he had no alternative except to end her life and his own. This made a huge impact on my father; he understood what the man was going through and wanted to help others like him.” McCarty approached Visiting Nurse Health System about creating a program to support the caregivers of Alzheimer’s patients. Thanks to his generous support, we launched the Alzheimer’s and Parkinson’s Respite program in 1990. Since then, Eleanor and Bill Cheney continued to fund the program in her father’s honor, helping more than 1,000 families cope with the effects of the disease and other dementia. If you would like to make a donation in Eleanor Cheney’s memory to Visiting Nurse Health System in Atlanta, GA please click here, or call 404-215-6010. 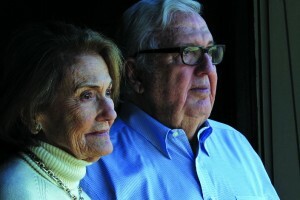 Watch the 2013 fall event video of Bill and Eleanor Cheney here.